I have had a stand up paddle board (SUP) now for over two years and it has definitely had quite a bit of use over that time. I’ve not used it as much as I’d have liked though as having just one means that it’s hard to take other people out with you. Adventures on the sea are always much more fun with other people. It was because of this that I’ve been longing for a second SUP for about as long as I’ve had my first. So when, over a year ago, Fatyak unveiled their designs for one, I started watching eagerly. I already have two amazing kayaks from them and they have proven to be super reliable and fun on all the trips I’ve taken them on. 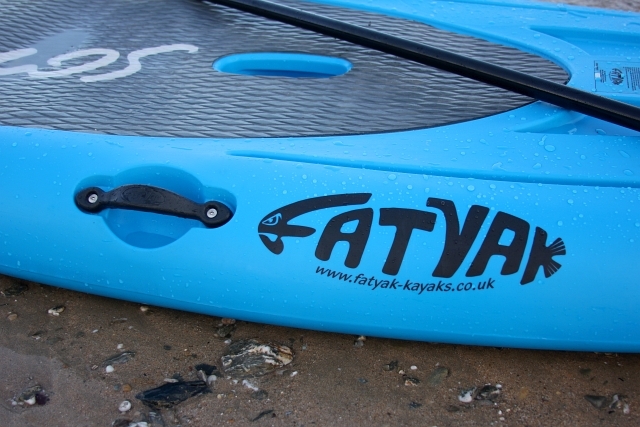 Fatyak’s SUP is called the Samos and I’m delighted to have got my hands on one very quickly after its launch. You can see it on my roof rack, sat on top of my old reliable red one in the photo above. When it arrived I was not disappointed. The colour is fantastic. I chose the Light Blue version, however, you can also get this in orange, green, yellow and red. When it arrived, I was dying to try it out and check out the features included. Vicky and I made the most of the good weather this weekend and headed to the beach, SUP included. 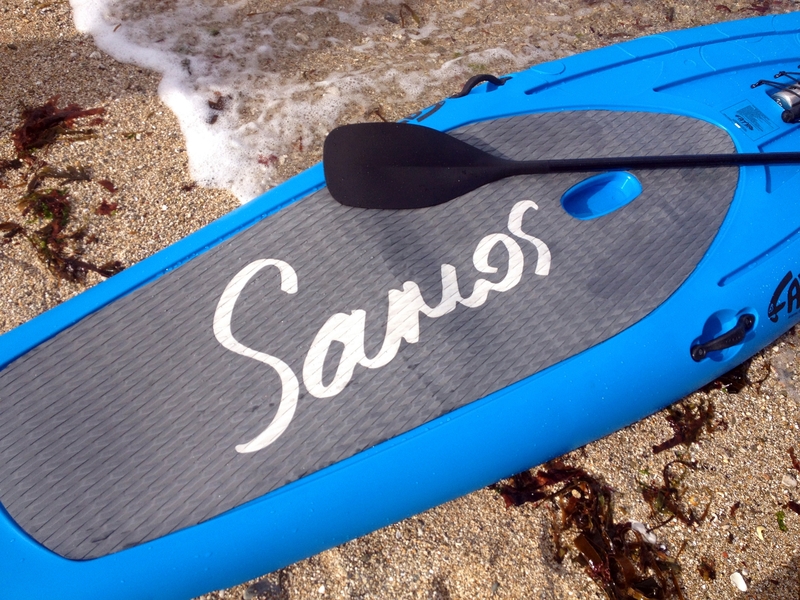 Out on the water, the Samos proved a success. I’m going to start this review by explaining the different types of SUP as it is important to give my review of the Samos some context. Most boards are a sort of fibre glass and are similar to a large surf boards. These are expensive and often cost around a thousand pounds; the fibre glass construction makes them thin, light weight and fast. However, the downside apart from the price is that, like a surfboard, they can easily ding and wouldn’t appreciate being bumped into a rock! 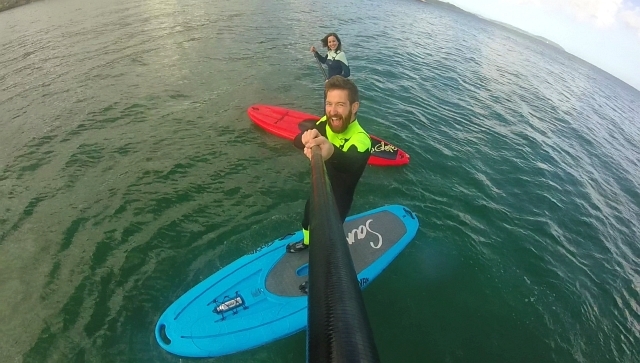 Another popular type of SUP is the inflatable kind, these are sometimes cheaper although not as strong or fast and can be easily transported in a boot. They are tougher than the fibreglass kind although can still be punctured by sharp objects. The biggest problem is that despite being surprisingly rigid, they still do sag in the middle and can be a pain because of this flex. They also need inflating and deflating! There is a third type of board which is rotationally moulded using polyethylene plastic. This is the same method that manufacturers make sit on top kayaks. The Samos has been created by Fatyak using their experience and skill with this production method. So what’s the point? 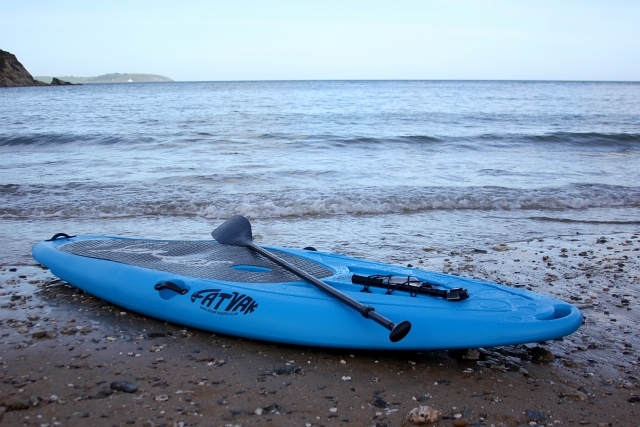 Why have Fatyak spent years designing a SUP like this when there are already lots of very popular styles of paddle board available? What are the advantages of rotationally moulded polyethylene plastic SUPs? The big one and it’s a huge one for me, is durability. 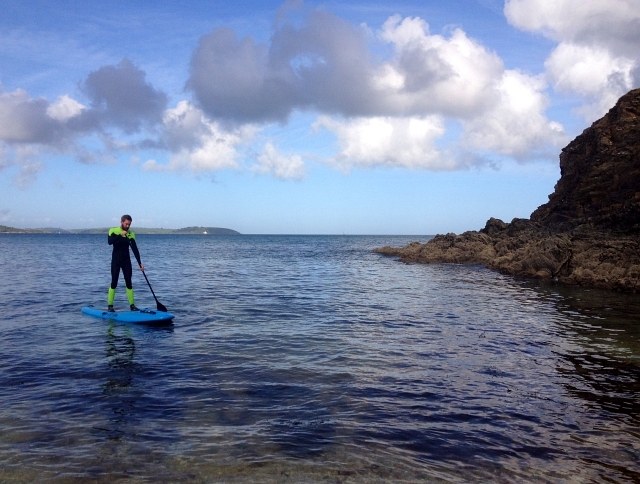 As far as I’m concerned SUP is all about mucking about on the water, exploring, playing and having fun. The Samos does all these things brilliantly. You can explore caves, rocks and every nook and cranny of the shore, safe in the knowledge that you wont do much more than put a little scratch on it. You can hand it over to any family member confident that they wont be able to kill it. 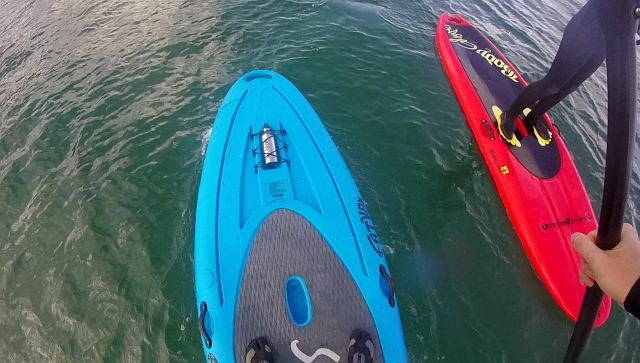 You can (and we do this a lot) paddle up next to your friend and jump between SUPs. It’s very tough, it’s very forgiving and it’s very fun. 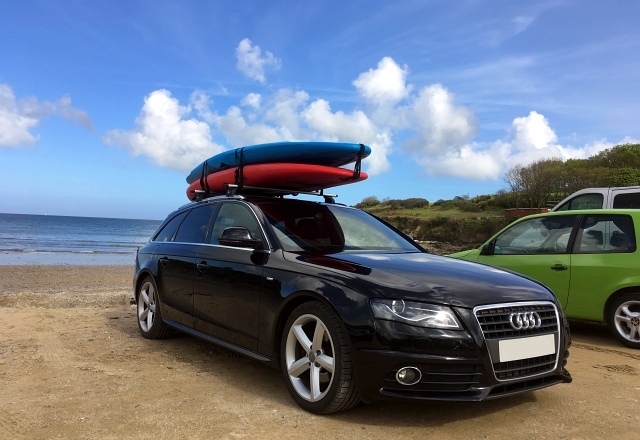 Now obviously, you wouldn’t compare a £400 10′ sit on top kayak to a £2500 16′ touring sea kayak or even a 5’6″ white water freestyle kayak. So in the same way there is no point comparing the Samos to a fibre glass board or an inflatable one. It’s all horses for courses and they all suit different purposes. Of course you can get lighter, faster and more agile boards, but I honestly don’t know if you can get one that is so accessible and is so much fun. I will be comparing the Fatyak Samos to my other SUP which is rotationally moulded and made by Body Glove. The carry handles on each side and tail, a big cut-out handle on the nose (just like on the Fatyak Kaafu) and a deep chunky handle on the deck area, makes carrying from the car to the shore a piece of cake. The deep deck handle has been designed ergonomically; there is a lip around the inside, which ensures you have a good grip when lifting. I was so impressed with how lightweight the Samos is to carry. I was able to lift it across the beach on my own. My old SUP and other kayaks are definitely a lot heavier and harder work than this. I’ve not been able to weigh them both to compare but the Samos must be just 75% of the weight of my other SUP. With the light weight Samos, loading on and off my new estate was easy. The deck pad is textured rubber, meaning you get good grip especially in choppier conditions. It provides a large area to stand on, so gives you freedom to manoeuver your feet around to feel secure. 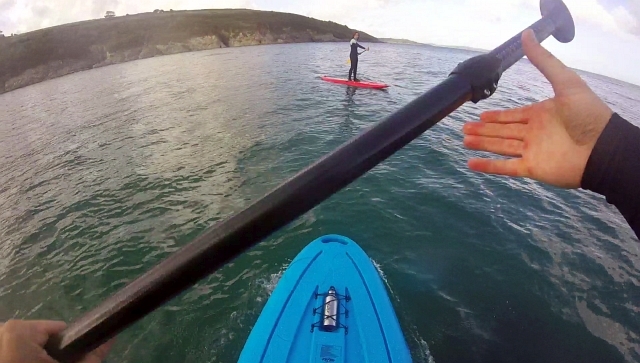 Although surprisingly lightweight, the SUP is pretty wide which aids stability when paddling. 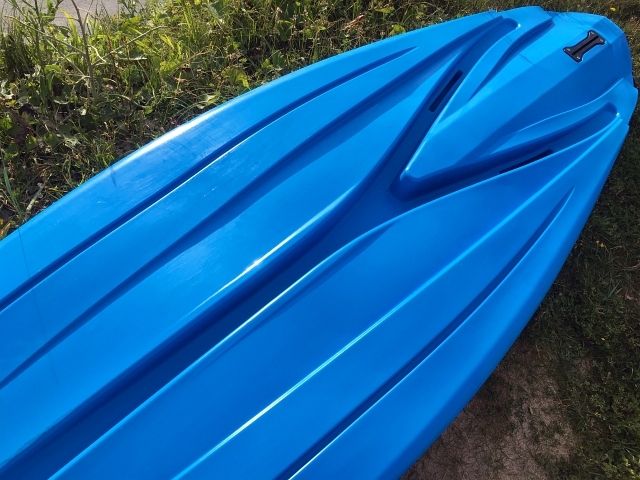 The board also includes a custom 10.5” fin box which will fit all standard fins and would give you further improved tracking when using the SUP. Again, they’ve done a brilliant job with the stability as despite being narrower at the nose and tail, it still manages to balance better than the Body Glove SUP, especially when travelling. Towards the nose of the board, on the deck, Fat Yak have included a very useful front storage section. These thick elasticated cords worked brilliantly to secure both my stainless steel water bottle and also my GoPro the whole day. You could easily store a few more bits under these cords. Or use them as a fastening point to secure something larger like a dry sack – perfect for taking more gear or even a picnic! What was great was the fact that for every SUP purchase from Fatyak you receive a complimentary Fatyak Mizu Stainless Steel Water Bottle (800ml). This bottle is 100% BPA and is not lined with aluminium like other similar bottles, so you won’t get any toxic substances in your drink! This was much more than just a cheap, throw-away freebie and something that I will be keeping with the SUP and using for a long time. 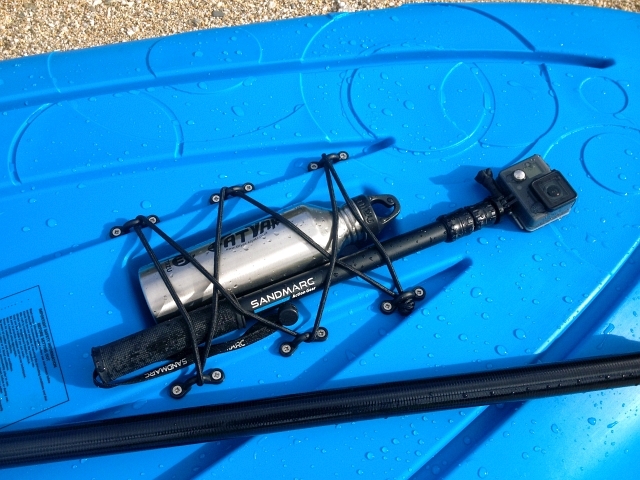 As with all of my water sports gear, it needs to be endurable. 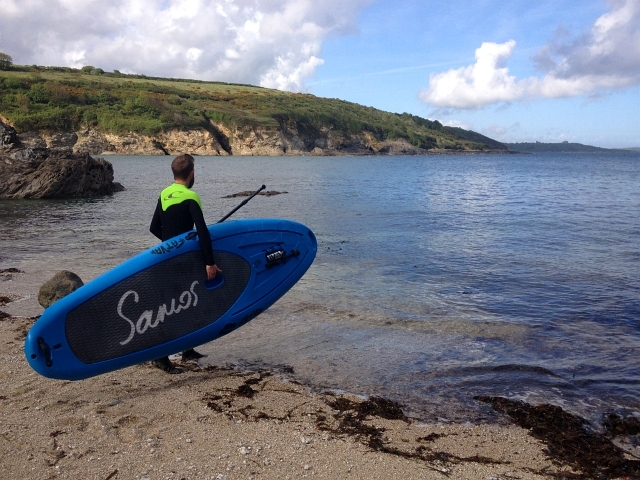 Thankfully, the Samos is made from a sturdy plastic, and is not inflatable or made from fibreglass, which means that it isn’t affected by bumping into rocks, exploring the coastline and caves, and dragging it out of the sea onto the sand; my normal day out at sea! The slight rocker and the rounded nose of the SUP, make this such a fun board to use and it was brilliant on the flat as well as small swell. 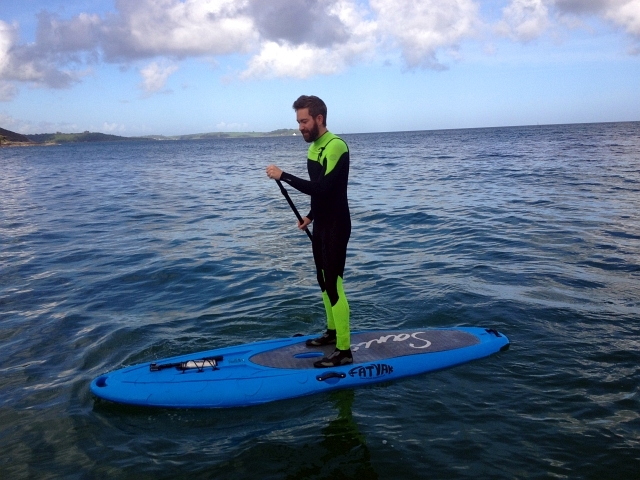 The width of the board did help to keep me stable when coming back through small surf. I’d like to take it out in some slightly big swell and see how it copes. On the underside is a unique wishbone design – this is no gimmick and works by acting against the natural yarding as you paddle. This really does help to keep the nose pointing straight. When compared to my other board it was noticeable. This was all without fins on either board. So with a fin on, it will glide through the water even straighter. 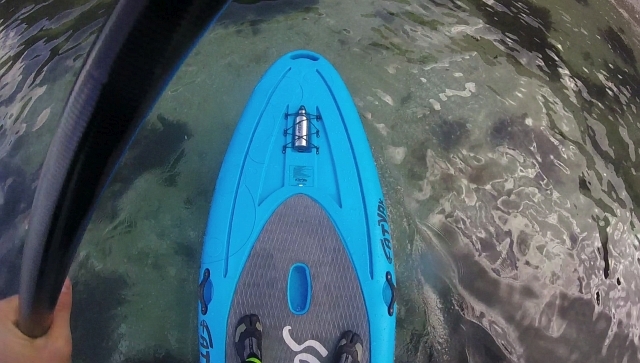 I really love the Fatyak Samos SUP, it’s a great improvement from my old plastic SUP. 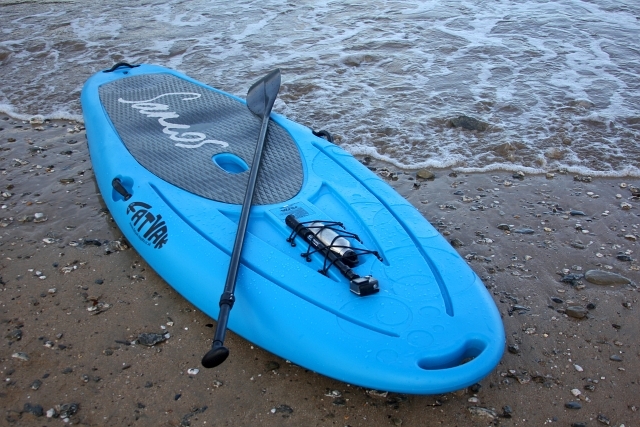 The intelligent design, excellent features and light weight build make it a really run and usable SUP that I know is going to be really popular with beginner and intermediate paddle boarders as well as families and friends. It’s going to the sort of board that everyone will want to have a go on, and that you will encourage people to use as it’s bulletproof as well as foolproof. 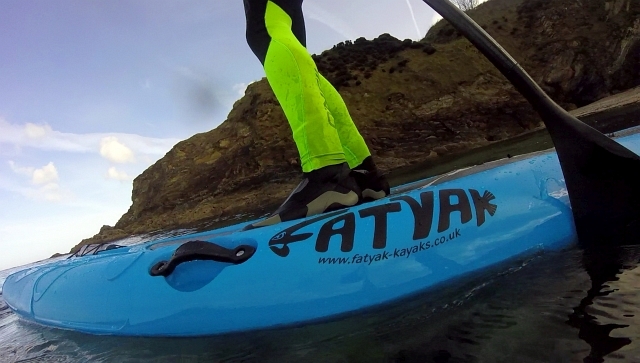 I’ve had such great fun using the Fatyak Samos so far and cannot wait to get out on it even more over the summer.